Jem Cohen's Museum Hours is a small movie that contains multitudes. By "small" I certainly don't mean that its ambitions are diminutive, only that its scale is intimate and its budget was by feature-film standards in the fallen world of today rather small. Its ostensible story can be told in a few lines. Anne (Mary Margaret O'Hara) has been summoned to Vienna because her name was found in the address book of a cousin who lies comatose in a hospital there. She has never been to Vienna before, doesn't speak the language, and has little money. Luckily—for both of them—she meets Johann (Bobby Sommer), a guard at the Kunsthistorisches Museum, who becomes her interpreter, tour guide, and friend. The movie is about the friendship between those two large-hearted and idiosyncratic personalities, but it is also about cities, art, time, sight, museums, property, collective memory, the flux of objects, displacement, transience, maturity, and a bunch of other things. When I first told a friend about seeing it, I employed a phrase that had never before crossed my lips. "It's a celebration of life," I said, with any imputation of irony drained from those words. So Bruegel's works could be said to be museums within a museum, and the movie itself adds yet a third layer of passionate accrual. Because one of Cohen's main points is that a museum, especially one with the depth of the Kunsthistorisches, is a living place—not simply a pileup of dead trophies (although that aspect is not neglected) but a fully inhabited collective public space in which the present keeps faith with all that has come before it. The faces and behaviors you see on the street were already accounted for and recorded centuries ago—the forbidding term "masterpieces" too often stands in the way of the works' immediacy. And a city is itself a museum in its accumulated layers of time, its recurrent patterns, its legends and rituals—even its trash, which fully finds expression in the flea market, a museum of dispersal and flux. And then the immigrant café near the Josefstadt tram stop is a museum of its clientele, their snapshots and mementos and empty Jägermeister bottles. Those accumulations help reinforce its community, to be sure, but it also welcomes in strays, who are tacitly invited to add their own notch. The two main characters are warm, perceptive, vulnerable people. Their relationship, which has been described by critics as something a few centimeters away from romance, is an ambiguous, chaste but passionate, passionate but fleeting encounter, only half-moored in the encompassing lives of the pair, of a sort that happens in life—on film sets, for example—but has seldom been described in a movie. Johann showing Anne around Vienna is a simple but effective ploy to show us the city, especially since both are thoughtful and curious and have little interest in the usual tourist trail. But our Virgil isn't Johann so much as the camera eye itself, which is constantly darting away to show us birds or thorns or faces or paintings or trash. It is as if the movie were thinking aloud, a witness and companion to Anne and Johann that enlarges upon their conversation and brings up supplementary illustrations or suggests amendments. By "camera eye" and "movie" in the above sentences I of course mean Jem Cohen, who directed, partly wrote (he points out that some of the dialogue was improvised by the actors), and, crucially, did the lion's share of the editing on the picture. Cohen's movies have never been anything but personal and subjective, although many have like this one involved sustained collaboration, particularly with musicians. I've worked with him myself, so I can testify that he is at once remarkably open to others' ideas and mulishly self-determined when it comes to such matters as photography, editing tempo, and maintaining a tone. He is generous, low-key, committed to his friends, an anarchist in his outlook, but he is above all an artist, and when he knows how something should look or sound or feel he pursues it singlemindedly until he achieves what he imagined. This unusual combination—porous, with a steel core—has assured a singular body of work: lyrical, self-questioning, imaginatively empathetic, serious with outbreaks of fun, sometimes dark, always restless, always socially conscious and personally considerate, and daring, even brash, although he never grandstands. Ethics and aesthetics are closely entwined in him. False notes are not to be found in his pictures. Cinema is his calling because, among other things, it can contain all the other arts. He thinks like a poet and a musician and an essayist and a painter—simultaneously. Museum Hours is both like and unlike other work he has made. It is not his first fictional feature film—that would be Chain (2004), but that bleakly beautiful picture was perhaps less mindful of the pleasure principle than this one. 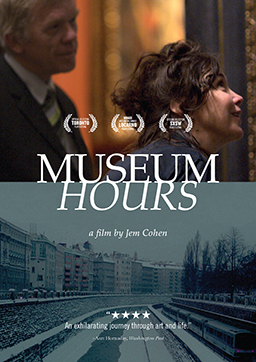 Museum Hours suggests Cohen's descent from Jean Vigo and Chris Marker, two poetic filmmakers who were fully engaged with the world and knew how to balance thought and feeling. Museum Hours opens discussion, and you can, as I did above, draw up a considerable list of topics it takes up, mulls over, examines from different angles. But while it is possible to say what the movie is about, it is much more difficult to encapsulate what the movie is. In its modest and unassuming way it is a total experience, composed of people, sights, sounds, history, travel, argument, speculation, fantastic beauty and ordinary life, woven together and maintained in aerodynamic tension. It is no more reducible than a day in spring.